Most people don't seem to know about the fifth good luck token, but my Mum did. She hoarded a few threepences, so she had one for each of her daughters, and I walked down the aisle with this one taped inside my shoe. 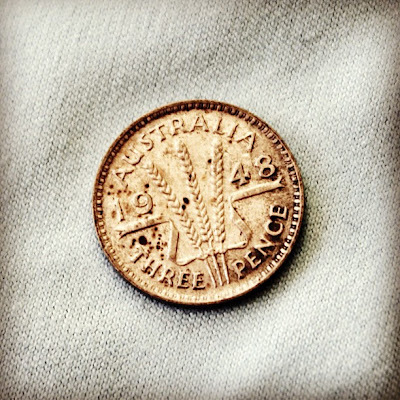 Wikipedia tells me it should have been a sixpence, but in my family the tradition always included a threepence ...Whatever, each token is supposed to bring a particular kind of blessing to the marriage and the coin represents financial security.